By NICOLE BRADFORD nbradford@dailysentinel.com | Posted: Tuesday, January 19, 2016 10:15 pm Updated: 7:29 am, Wed Jan 20, 2016. With her German shepherd, Merlot, riding shotgun, California artist Patricia Vader usually drives across several states to deliver her large-scale, outdoor sculptures. The truck is noisy, but she takes along spy novel audio books for the drive, and absorbs the sights. Created with co-artist Joe Bologna, Spring Bouquet is one of 10 sculptures on display at the Sculpture for All exhibit located on the SFA campus. Through it, Vader said she hopes to convey to viewers that sculpture can be fun, and can take many forms. Born in the Netherlands into a family of musicians, Vader was disappointed to discover she didn’t inherit a knack for music, and chose a career as a scientist. After a decade as an astronomer, she decided she wanted to do something else in life and opted to attend art school. After she moved to a large rural property, her creativity grew in more ways than one. “I started making things bigger and bigger,” she said. 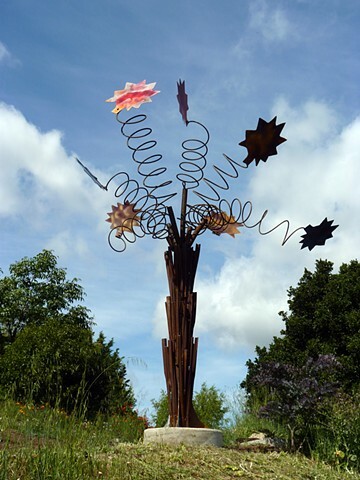 Her large, metal sculptures now can be found in cities and parks nationwide.